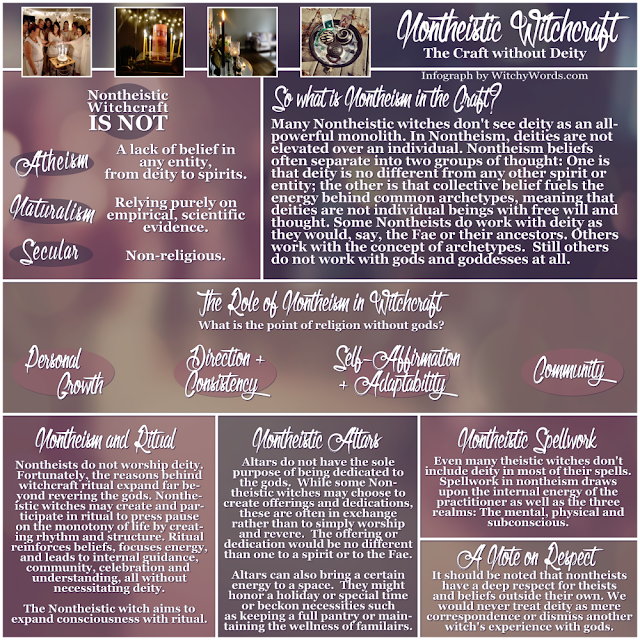 I've always categorized myself as an Eclectic/Solo witch, but seeing this infographic I think Nontheistic is more accurate. Thank you for this! Just found you overwhelmed and amazed. I was googling time management resources for goal setting. I found the graphic awesome! Do you have more pages or a section like about that topic? Thank you! Thank you so much, Cynth. Under my "For Beginners" tab, there's an article about Nontheistic witchcraft. My entire practice is tinted by it, so take a look around. Thank you again! This what I love about this religion. So much respect for other paths. Our many I have come across are non judgmental. Same, Kim! It's certainly what attracted me to it in the first place. Thank you so much!